Backorders are an existing feature that allows you to sell products that are out of stock in the warehouse when you create an order. You can display the available products for backorders as In Stock, or using a customized message like Available in ‘X’ days. This feature can increase your sales revenue and provide flexibility with selling products that are not available, but expected to have stock replenishment within a short time frame. Store level—You can enable or disable the backorder feature for each store. If enabled, your OMS allows all items to be available for backorder. If disabled, when your OMS receives an order for a SKU that is out of stock, the line is canceled. Order item level—Order Items that do not allow for a backorder are canceled if they are out of stock. 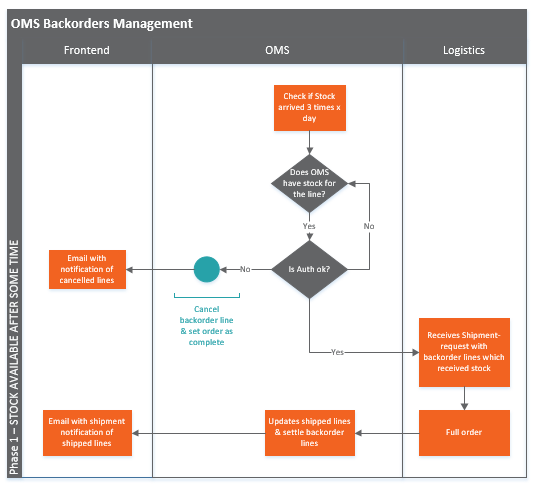 If backorder is enabled, your OMS splits a single order into several shipments. The sourcing logic allows you to configure the maximum number of allowed splits, or hold back an order if some of the lines are out of stock. For this to work, the logistics provider needs to be able to support multiple shipment requests for the same order. Your System Integrator (SI) can enable the backorder feature by sales channel. All items in the catalog accept backorders by default, unless defined differently. If backorders are not allowed, it still is possible to use them by defining allowed order lines with the [magento.sales.order_management.create](/en/specifications/#magento.sales.order_management) message. Your OMS checks lines with stock status in backorder and holds them until the stock becomes available. Depending on the payment method, orders with lines on backorder and regular lines have multiple settlements (one for each shipment). If the backorder configuration is not enabled, and in your OMS a SKU is out of stock, the line is canceled. You can set a threshold of days that are used to flag the backorder lines as exceptions in the exception queue. Once the specified day limit is reached the exception is reported with a High severity status. 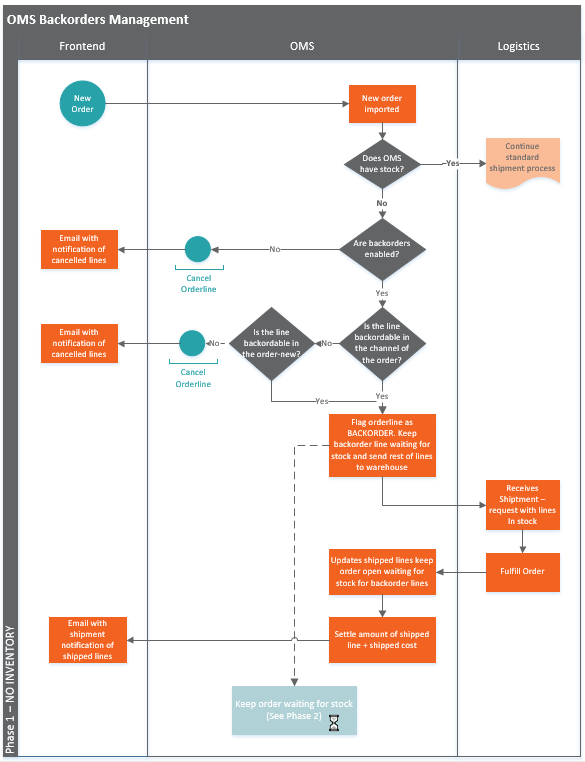 Use this configuration to manage the Federal Trade Commission (FTC) compliance, ensuring there is a process for obtaining customer consent to comply with regulations. A configuration will determine after how many days from the order creation a backorder is defined as an aged backorder. For aged backorders, the system uses the stock snapshot to validate which of the agedBackorders received stock. Then the agedBackorders are re-queued for the next allocation wave (same day). For example, an order created on January 1st, when the current date is January 2nd, is sent to be sourced for each configured wave. For example, an order created on January 1st, when the current date is January 25th, is not sent to be sourced on that date. Backorders are displayed in the allocation queue even if the client is using the default mode (Direct). An order with backorder lines automatically applies a re-auth strategy to ensure that you are able to capture the money once there is available stock. This process typically takes place every ten days and can be set by your SI. For more information on how backorders are displayed in the Admin, see the Backorders page. In order to increase visibility for this feature you will see a label for backorders in the Admin.